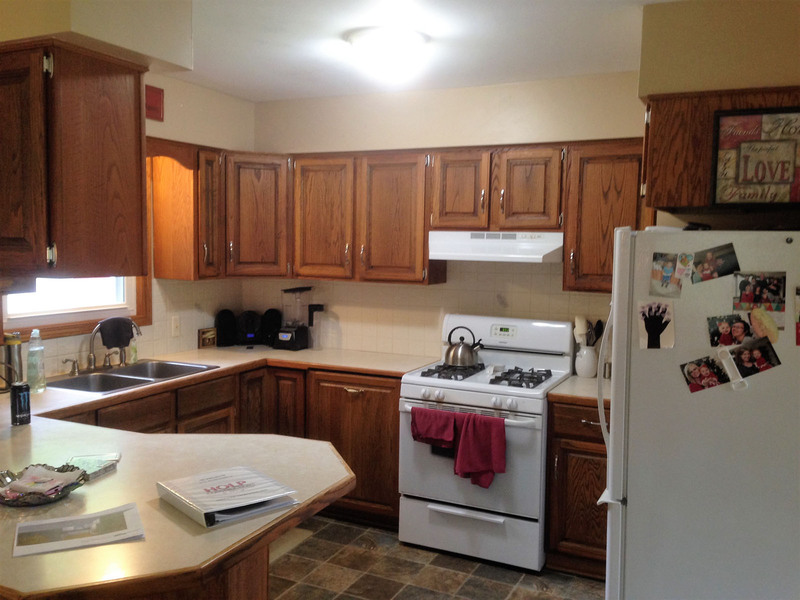 What a transformation a kitchen remodel can have on an existing dark and heavy space. We removed many of the elements that made this kitchen feel small and closed in. We opened the space by removing the bulkheads and the side wall where the existing refrigerator was located. This was a full kitchen remodel involving removal of the bulkheads and drywall to the studs for new up to code plumbing and electrical. LED Recessed lighting was installed to illuminate a once dim space. New drywall was hung and finished. New Diamond Prelude cabinets with Arden door style were installed for a more user-friendly space. Granite counter tops were selected by the customer in color majestic white. A subway tile was selected by the customer for its horizontal lines. An accent boarder of one inch black granite mosaics was selected and charcoal grout finished off the look. To keep the horizontal lines, we turn the electrical receptacles along the backsplash area. 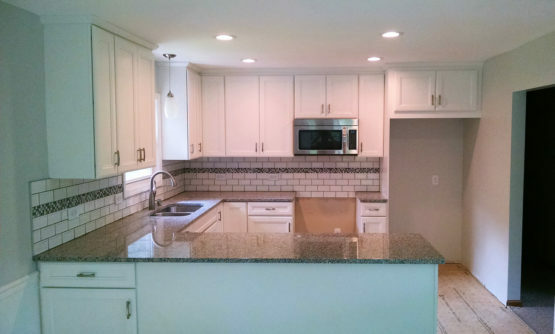 This kitchen has been transformed from oak and neutrals to Bright & White but not without some remodeling pains. Some of those pains were damaged sub flooring from plumbing leaks, additional floor leveling, plumbing and electrical was found after demo in bulkheads, all which added some additional cost. "Our goal is to make each new customer a return customer and our #1 referal"
© 2017 Holp Construction. All rights reserved.